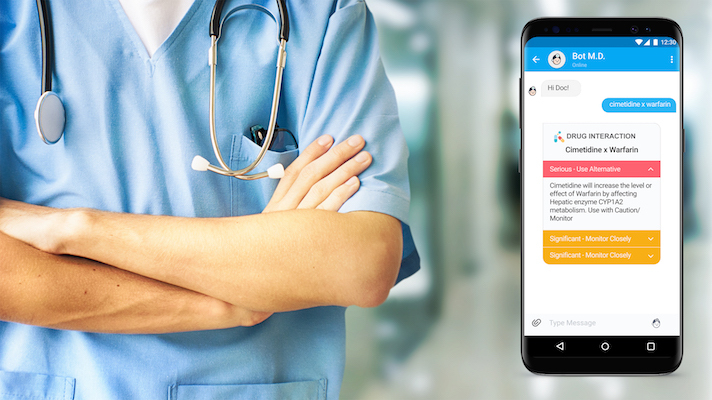 Bot M.D., maker of an AI chatbot app for doctors, has raised $700,000 in seed funding from Y Combinator and angels, including Silicon Valley notable Steve Blank, one of the inventors of the Lean Startup method. The company launched its app of the same name about four weeks ago. "If you ever try searching stuff on Google, Google is a consumer-facing search engine, right?" Founder and CEO Dorothea Koh told MobiHealthNews. "So the stuff on top is always going to be WebMD, Mayo Clinic, [etc.]. These are not websites that doctors would necessarily go to for information. They want information from journals, they want information from peer review, reliable sources. And that’s exactly what Bot M.D. does for them." Bot M.D. is meant to be an alterantive source of information for doctors, primarily the information they need in the course of their work like drug interactions, medical calculators, some guidelines and protocols, and information on less common diseases. Doctors can even use it to find medical images and videos. The app uses artificial intelligence to present this information in the form of a personable and even humorous chatbot. The app is designed to help doctors all over the world, especially in areas where physicians and information might be in short supply. Just a few weeks after launch, Koh told MobIHealthNews, the app is already in 52 countries. Some of the emerging markets include India, Egypt, Nigeria, Venezuela, Chile, Thailand, Indonesia, Philippines. In addition to offering information, the app has dictation/transcribing functionality. "In particular in Venezuela, one of our doctors told us in his hospital, they’re kind of rural and remote," Koh said. "So they have eight medical residents who have to fight over one computer at the end of the day to type up all of their case notes. So the transcription thing, which is basically automatic voice detection transcription, is basically a lifesaver because all you have to do is record it and it transcribes it and you can email a copy to yourself." The app also includes a chat feature that lets doctors securely chat with one another, and even call Bot M.D. (the AI) into the conversation if they need additional information. "The idea behind that is that patient care happens in teams," Koh said. "Most doctors are on some kind of messaging platform and it’s usually groups of doctors. So our thought was ‘We don’t like changing doctor behaviors, let’s take what they’re used to doing, make it easier, and facilitate that.’ So that’s another feature in the app that doctors have said they quite like, the idea of connecting one doctor to another doctor." The free app is currently available on the Google Play store. While information will always be core, Koh hopes to add more features that address real pain points for doctors. Beyond that, the startup will support its burgeoning rollout and continue to make the AI smarter. The company will be presenting at an upcoming Y Combinator demo day.